Kindle Fire HD has a pre-installed Photos app for all you photography lovers. Though its features are pretty basic, Photos allows you to view and do minor edits to photos. The Kindle Fire HD’s camera can’t capture photos, so you have to get photos onto the device by saving an image from the Internet using your Silk browser or copying them from your computer by using your Micro USB cable. Using this procedure, you can copy photos into the Pictures folder on your Kindle Fire HD by using Windows Explorer or the Mac Finder. After you load photos into your Pictures library and disconnect the Micro USB cable, you can tap the Photos app on the Home screen. This displays an album that represents the folder you copied to your Kindle Fire HD and other albums for other sources, such as for downloads and screenshots. If you copy another folder of photos, it will come over as a separate album. Photos in albums are organized chronologically by the date you placed them on your Kindle Fire HD. Tap to open an album and view the pictures within it. Tap a picture to make it appear full screen. Swipe left or right to move through pictures in an album. 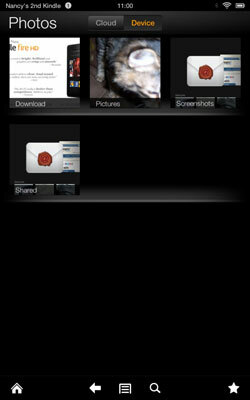 You can also tap the E-Mail button in the Options bar while in Photos to e-mail the displayed photo. Another method to share via e-mail is to tap the Options bar, tap Share, and then tap Send with Email. In the e-mail message that appears with the photo already attached, enter an address, subject, and message, and then tap the Send button. Move photos: To move a photo, you need to go to the Amazon Cloud Drive using a browser (go to Amazon.com, tap or click Your Account, and then tap or click Your Cloud Drive on the list that appears; you will have to sign into your account at this point). Use the More Actions drop-down list and choose Move X Items To . . . (where X is the number of items you’ve selected) and then choose the folder on your Cloud Drive to move the item(s) to. Rename: You can rename a picture or albums from within Cloud Drive by tapping or clicking the More Actions button and then choosing Rename. You can also rename an album from your Kindle Fire HD in the Photos app by long-pressing (pressing and holding for a few seconds) the album and choosing Rename from the menu that appears. You can click the New Folder button to add albums to help you organize your photos. Note that when viewing photos on your Kindle Fire HD you can also enlarge or reduce a photo by pinching and unpinching with your fingers on the touchscreen. When you display a photo full screen in the Photos app, you see tools at bottom of the screen, including Zoom In, Zoom Out, and a tool that causes the image to fit within the screen again if you’ve enlarged it. With a photo displayed, if you want to delete it, simply tap the Trash button on the Options bar.